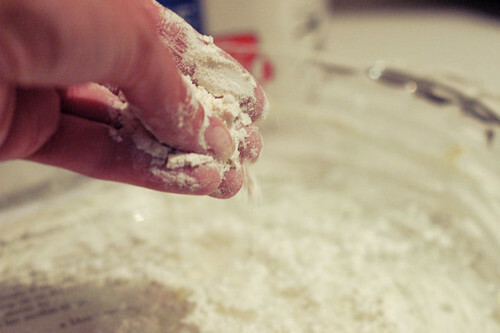 I miss baking, and fortunately, I’ll be moving soon. The new house has a kitchen I’ll absolutely want to hang out in, and I can’t wait. I’m hoping to get back into the swing of things and to give this space a little bit more love. 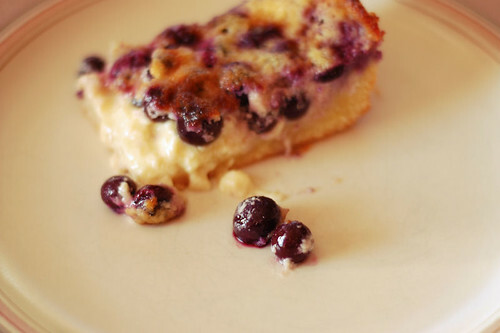 My brother requested a recipe with blueberries, and so I flipped through the book and picked out this pie. 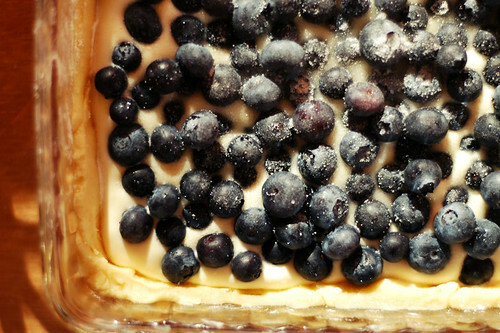 The English name for kermaviili-musikkapiiras is “blueberry sour cream pie.” In Finland, it’s made with a special product called kermaviili. Ojakangas describes viili as “a yogurtlike clabbered milk that is much more delicious (to a Finn) than yogurt.” From what I can gather, it’s a bit like sour cream or crème fraîche. As a substitute, she suggests adding lemon juice to heavy cream, which is what I did, but I can’t help but wonder what this pie tastes like when made with actual viili. 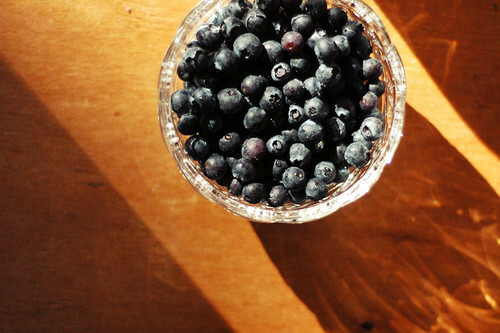 The recipe is a rather simple one, with a pleasant (if not amazing) outcome. 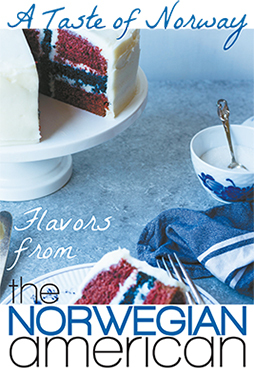 The pie is tasty, but it’s probably my least favorite of the pies I’ve baked from this book so far. I made a few modifications to the recipe as I went along, as I often do. 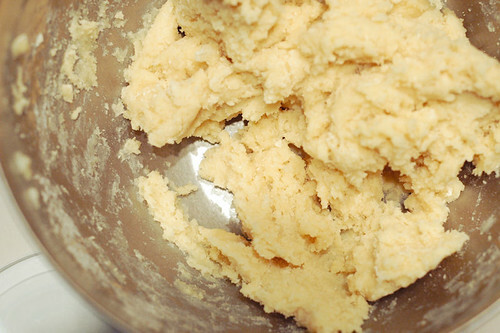 This time, as I was preparing the cream filling, I spent some extra time whipping it up so that it would thicken a little bit. Ojakangas doesn’t specify how long the filling should be mixed for, and she definitely doesn’t instruct you to whip the filling, but f I hadn’t done this, the blueberries would have sunk right to the bottom and I expect it wouldn’t have set as it baked, either. The pie looked quite pretty before it went into the oven – much prettier than it looked coming out. 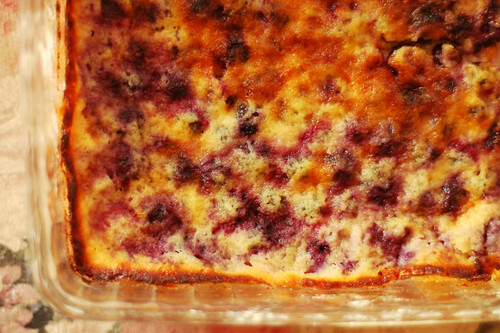 But the berries were soft and warm and gooey and the cream filling was tasty and the crust was buttery. It may not be my favorite pie, but it’s hard to go wrong with that, right? 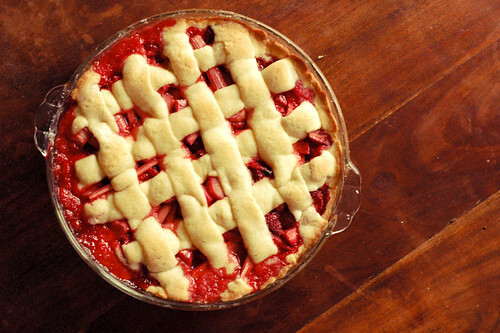 After I lost the photos of that strawberry tart I baked (mentioned here), I decided to bake the whole thing again. 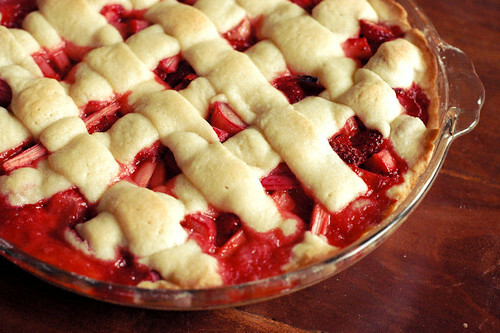 Since it was a fairly simple tart/pie recipe, I thought I’d try making it with rhubarb as well after Tyler put in a request for strawberry rhubarb pie. The original pie, made to the recipe’s instructions, was quite delicious. The rhubarb took it to a new level, in my opinion! 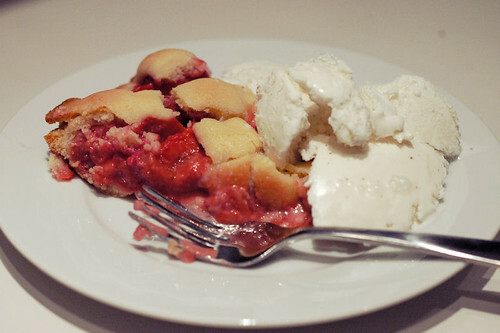 The original recipe was a little sweet (which is great) but the rhubarb brought in a nice balance in the flavor. 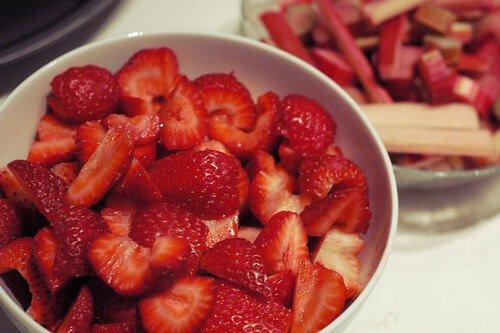 Strawberries and rhubarb, waiting to be made into pie filling. The recipe for the pie crust is super simple, but I found that both times I made the pie I wished I’d had just a little bit more dough. It seemed on the short side to me. One other change I made from the written recipe was to bake it for a little bit longer than the 25-30 minutes given in the recipe. The first time I made the pie the crust was still a little bit doughy, but this time around it came out much, much better. It was probably in the oven closer to 35 or 40 minutes. The great thing about making a recipe more than once is being able to make little changes to your method, so that next time, you always know it’s going to come out even better. I’d call this one a success. A few weeks ago my Norwegian class had a potluck and watched two episodes of the popular and hilarious Norwegian reality show Alt for Norge. There was both non-Norwegian and Norwegian fare to eat (I had my first fiskeboller) but everything was delicious. 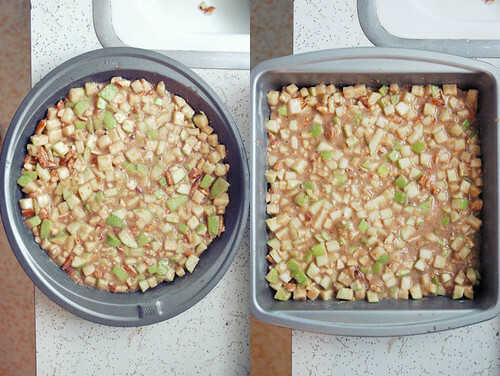 It seemed like a great excuse to try out another Norwegian recipe, and since we’ve entered apple season I picked the Norwegian eplepai. It means apple pie, but it’s more of a cake, really. Whatever you call it, I was really happy with how it turned out! Since I was bringing one to class, I decided to bake two (so that my roommates and I had some at home as well!). This was a ridiculously simply recipe – the instructions after the ingredients list fit in a five-line paragraph. 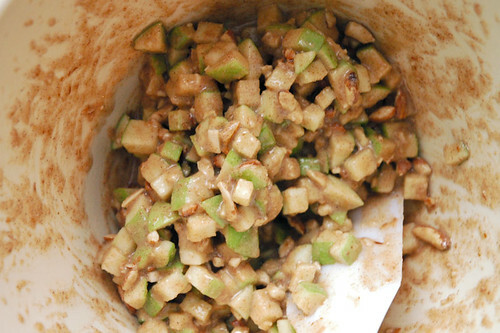 You dice up your apples, chop some almonds, mix everything up in a bowl and then bake. There are also instructions to make a whipped topping/side, but as I was short on time I opted to serve it with vanilla ice cream instead. 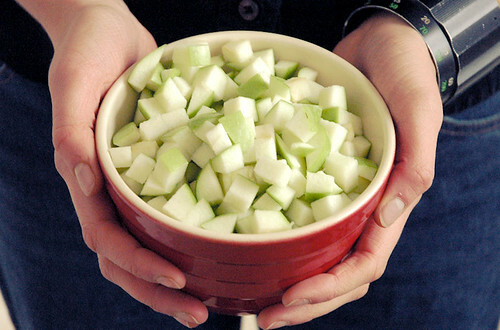 My friend Melodie helped crush the almonds while I chopped up the apples. Next I mixed all the ingredients, spooned them out into the greased pie pans, and then they baked! 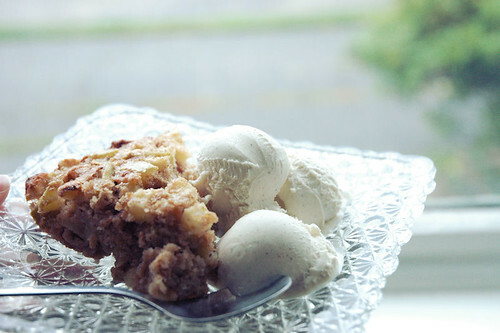 Like I said, it was a really simple recipe and it made a great last-minute dessert. The pie was a hit at the potluck and at home, where we ate it still warm from the oven with ice cream!